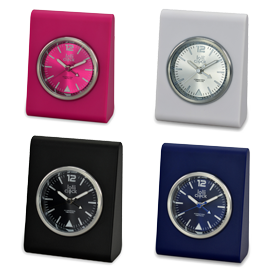 ABS Plastic case with stainless steel top ring, 3 hands movement with alarm function, colored metal dial with sunray finish and luminous hour/minute hands, and raised hour markers. 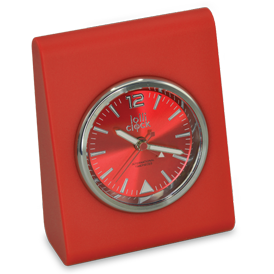 Includes colorful two piece gift box in matching color. 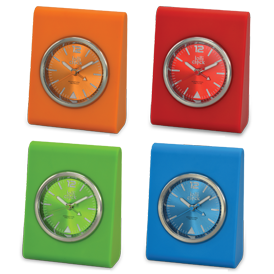 Available in 8 different colors, the alarm can be displayed in four different positions! 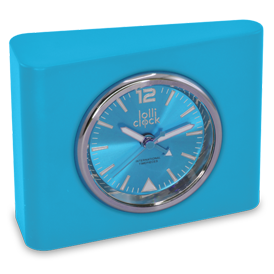 Overall Size: 2-5/8" x 3-3/8" x 1-1/4"
Stock Colors: RD Red (PMS 485), MG Magenta (PMS 1925), BE Blue (PMS 289), BK Black, WE White. 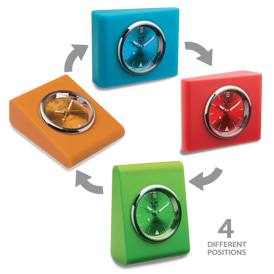 Available at 300 pieces: LGN Light Green (PMS 376), OE Orange (PMS 151), LBE Light Blue (PMS Process Cyan).